Be honest. When you heard that Strelets were going to produce a set called 'Roman Transport 3', you weren’t expecting anything like this, were you? Nor were we. Well, this is what we got anyway, and while we might wonder exactly what level of demand there was for such a vehicle, they are at least being original. So, the obvious questions are what is it and what use is it? Today a vehicle like this would be used to transport suspects to a police station, to court or to prison, but did the Romans have something similar? The short answer is we have not been able to find out. Perhaps unsurprisingly there is much material on the forms of Roman Law and nothing on how it worked in terms of transportation vehicles. This leaves us to speculate on whether such a vehicle is likely, and we are really unable to decide. Custody is a relatively modern concept as a punishment - Roman punishments were mostly fines, corporal punishment, exile or even death, but not prison. Prisons, such as they were, were generally used to hold people awaiting trial, and for many this meant merely house arrest, so the need to physically restrain proven or suspected transgressors was far less than it is today. Also moving a prisoner would usually be a simple matter of putting them in chains and escorting them to where you wanted them - vehicles were fairly uncommon, especially for the movement of people, and the size of most towns made such luxuries unnecessary anyway. For a very long journey a vehicle might seem more practical, but such a journey would be rare, so we find it very difficult to accept that there were many of this sort of vehicle around, despite it being very simple and apparently useful. One further possible use would be the movement of prisoners of war. Again however, such prisoners, who if taken back would be intended to be sold as slaves, would have had to walk like everyone else, and be chained to prevent escape. Was such an exotic vehicle used for the high status captives such as Vercingetorix after the fall of Alesia? We don’t know, but there remains a nagging doubt. If such a vehicle did exist, would it have looked like this model? Well it would certainly have had walls that met at pillars at each corner, which this one does not have, and probably a door too, which again seems to be absent here. The solid wheels are perhaps reasonable, although the Romans were well aware of spoked wheels, and the two oxen that provide the engine here were the most common, if slow, form of power in use at the time. With zero evidence it is hard to say more, but we are on firmer ground when discussing the merits of the vehicle as a kit. Like so many Strelets assemblies the whole thing is pretty crude, with all the edges being very rough and a very basic method of attaching parts. Holes are huge, as are pegs, and while everything fits together the walls are quite irregular and the result is very untidy. The roof has a number of pegs front and back plus one at one side whose only purpose is to stop it fitting on the wonky wall sections, so goodness knows what the designer was thinking there. There are no instructions, though assembly is easy enough, but the result is pretty inferior, and certainly nothing as neat as the item pictured on the box. The main body of the vehicle measures about 33mm (2.4 metres) long and 21mm (1.5 metres) wide, which is roomy enough for quite a few prisoners, depending on how you position them. The purpose of some of the figures is clear enough. The first is obviously the driver, while the next two are guards with a spear and staff to keep the prisoners in order, and the man with the hat could be encouraging the team. After that it gets much more uncertain. Presumably most or all of these figures are captives, since none have anything but their clothes. Some have merely a loincloth, others a simple tunic and one man - clearly a 'barbarian' - has trousers. One man has his arms bound, and two are holding their heads for some reason (grief?). There is a woman and child, and a nice pair of one man supporting another. The figure with no base in the middle row is particularly intriguing. He is not on the ground as his body is far from flat, so we can only guess that he is supposed to be leaning up against the bars of the vehicle. Basically you can decide for yourself what these figures are doing - prisoners or onlookers - they would look little different much of the time. By Strelets standards the figures are quite slim and reasonably well-proportioned. Lacking much clothing or any kind of equipment there is little call for fine detail, but the faces are not too bad. There is no flash, but purchasers will spend most of their time removing the wagon pieces from the very many attachments to the sprue. It is really hard to get much excited by this product. The wagon is quite crude and we cannot find any actual evidence that such a thing existed, which is not to say that it did not, although in the past Strelets have sometimes taken their inspiration from films rather than real history, so some doubt must be there. 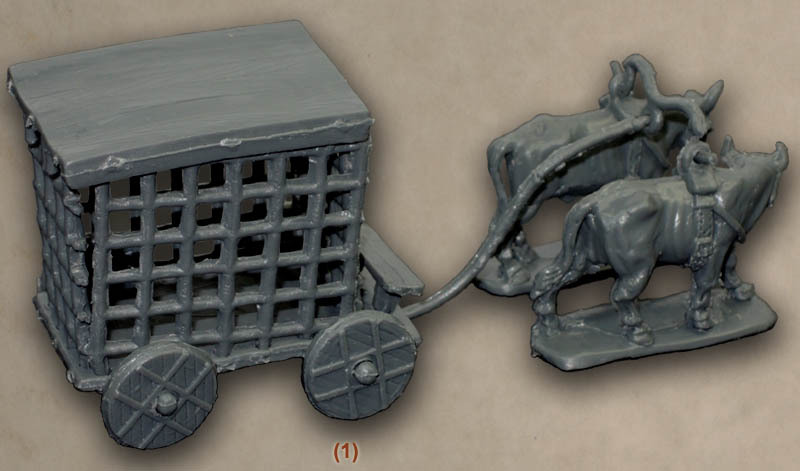 Perhaps using it to transport wild animals might make more sense, though the proportions are not ideal for that. The figures pretty much do what they are supposed to, which is stand around looking unhappy, so they are far from exciting, although of course they are not intended to be. The sculpting is quite good for Strelets and works for a subject that makes few calls on delicate detail, so at least the figures could find a use in many civilian scenarios and one or two might perhaps work on a battlefield too.